Danielle Leigh has a 7 On Your Side investigation into school under funding. NEW YORK (WABC) -- As Governor Andrew Cuomo and the New York state legislature debate how to address inequity in the classroom, Eyewitness News has found a direct connection to student achievement and state spending. Eyewitness News compared student SAT scores on Long Island in 2017 to state funding with help from the Alliance for Quality Education, as part of an ongoing investigation into New York's failure to follow its own formula, known as Foundation Aid, to make sure the neediest students get the help they need. 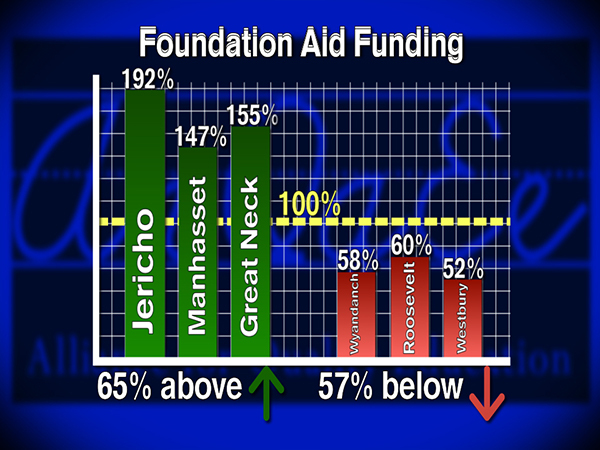 Our evaluation found that the top three performing districts, Jericho, Manhasset, and Great Neck; are over-funded by the state, receiving on average 65% more than their share of Foundation Aid, and spending on average about 26% more per student. Meanwhile, the three lowest performing districts on the SAT's, Wyandanch, Roosevelt, and Westbury; are underfunded by the state, receiving on average just 57% of the Foundation Aid they are owed. The difference in SAT performance was great enough to potentially impact a student's options for college. 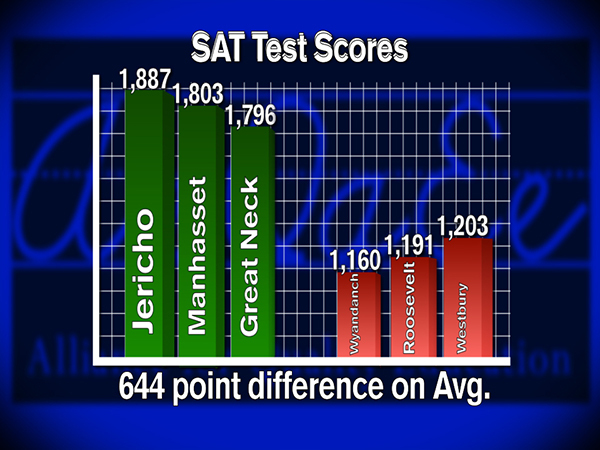 Those top performing districts received an average SAT score of 644 points higher than the lowest performing districts. "Money matters," said AQE Executive Director Billy Easton. "The research is really, really clear. In education, money matters." While New York spends more per student than any other state in the country according to the US Department of Education, how that money gets divided up is far from even district to district in part because more affluent areas can supplement state funding with a higher local tax base. For instance, on the high end, Fire Island spends $146,071 per student while General Brown spends just $15,114. New York City spends $26,137 per student according to data from the New York State Education Department. The state legislature sought to reduce this disparity through the creation of Foundation Aid over a decade ago, but lawmakers have never fully funded it in an effort to save money, leaving districts to fight for their share. This year, the New York legislature has proposed boosting Foundation Aid funding by about $1.2 billion with plans to fully fund it over several years, but Governor Andrew Cuomo opposes their plans. He's suggested increasing Foundation Aid funding by $338 million. "We're going to do more this year but we spend a lot," Cuomo said in an interview with Eyewitness News. "We also have to respect the taxpayer and that's the balance." Education advocates argue the Governor's position fails to address the inequity in classrooms that causes significant differences in student performance such as the disparity in SAT scores on Long Island exposed by Eyewitness News. Easton said the state should do more to give all students, in all communities, rich or poor, an equal shot. "It frustrates me that the Governor has for so long been able to get away without addressing the real issues in the classrooms," Easton said.